On a sunny afternoon in a lush garden outside of central Munich, chef Tohru Nakamura is picking cucumbers — a mix of stubby gourds, knobby Japanese varieties that curl like snakes and inch-long striped cucumbers that look like Lilliputian watermelons. In his left hand is a bushy bouquet of dark purple aka-jiso (red perilla), cultivated from seeds that his father had secreted in his luggage following a trip to Tokyo. The leaves have a vegetal undertone, with a slightly sharper flavor than their Japanese-grown counterparts; Nakamura plans to use some to flavor pickles and experiment with the rest. 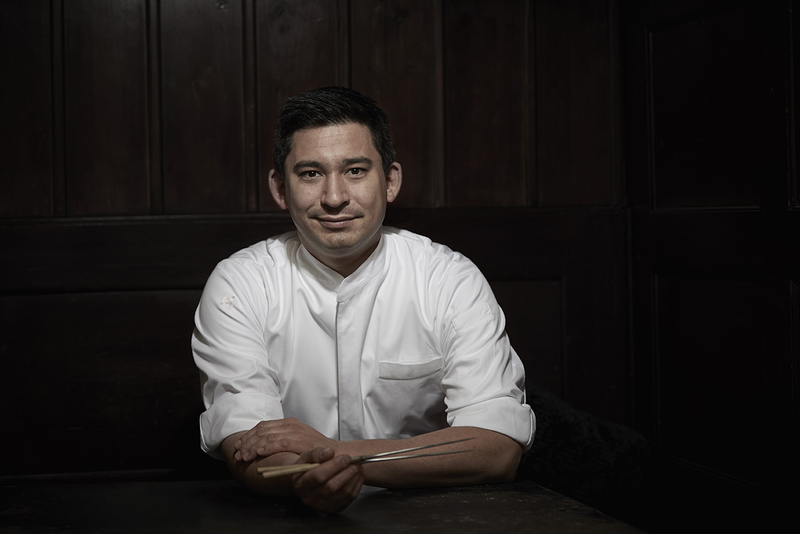 Japanese influences and ingredients are seamlessly interwoven into the refined cuisine he serves at Geisels Werneckhof, the two-Michelin-starred restaurant he runs in the Bavarian capital. Nakamura — whose father is from Japan and mother is from Germany — displays his bicultural heritage to winning effect, in a style that combines Japanese and German traditions in subtle yet surprising ways. The result is a far cry from the stereotype of Asian fusion (“the F-word,” Nakamura jokes) that emerged in the 1990s. He began helping his mother in the kitchen when he was 3 years old, chopping vegetables and stirring pots. The experience gave him an early appreciation for dashi and miso, alongside roasted game and aged cheeses. “My mother was always cooking Japanese food, never strictly German. Even if we made a simple chicken soup, we’d add a little soy sauce, and no one thought of this as fusion,” he recalls. 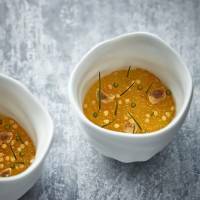 When he started his professional career, as an apprentice under Martin Fauster at Michelin-starred Konigshof, he had already begun contemplating ways to “bring in some Japanese aspect” to the dishes. 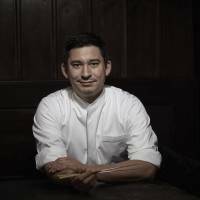 While working at Vendome, one of 11 establishments in Germany with three Michelin stars, Nakamura was tasked with coming up with suggestions for recipes and introduced Japanese elements — such as kobujime (the technique of marinating fish between two blades of kelp) — long before ingredients such as yuzu citrus became ubiquitous at restaurants overseas. 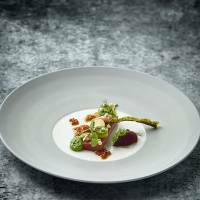 “Nobody thought that it could match (German cuisine) so well, but I had firsthand experience that it could work. It was natural for me,” he says. 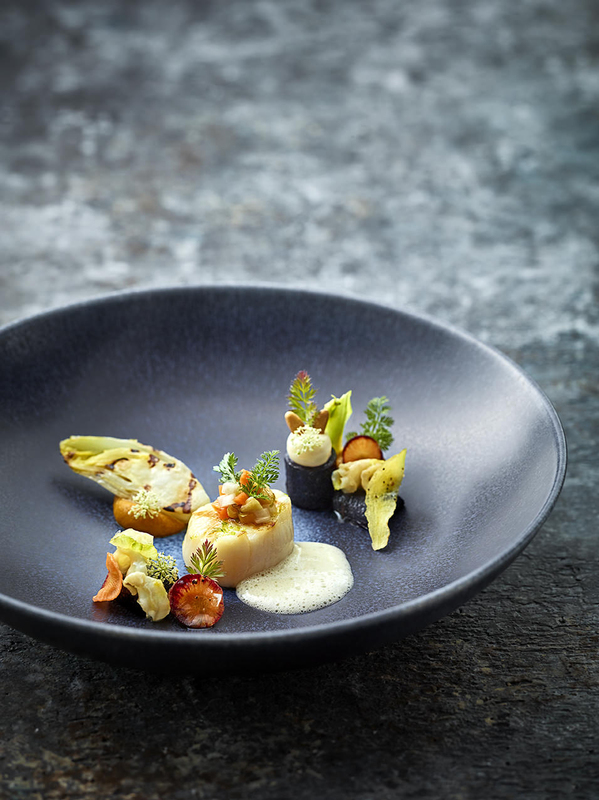 Upon taking over the kitchen at Werneckhof five years ago, he changed the menu completely. The restaurant, which is housed in an historic inn with an art nouveau interior, had previously served classic German fare, and guests who had expected to tuck into leg of lamb, roasted pork or schnitzel were baffled by the new concept. Nakamura’s confidence, however, never wavered. Soon, the restaurant gained a steady following, along with numerous accolades. I sampled his food for the first time earlier this year, at an event to celebrate the release of the 2018 Opinionated About Dining guide in London. Japanese-European hybrid cuisine is common in Tokyo, but there was something intriguing about Nakamura’s approach. 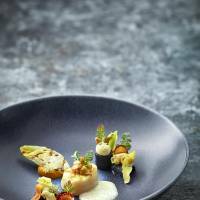 On my visit to Werneckhof in June, the meal exceeded my expectations. 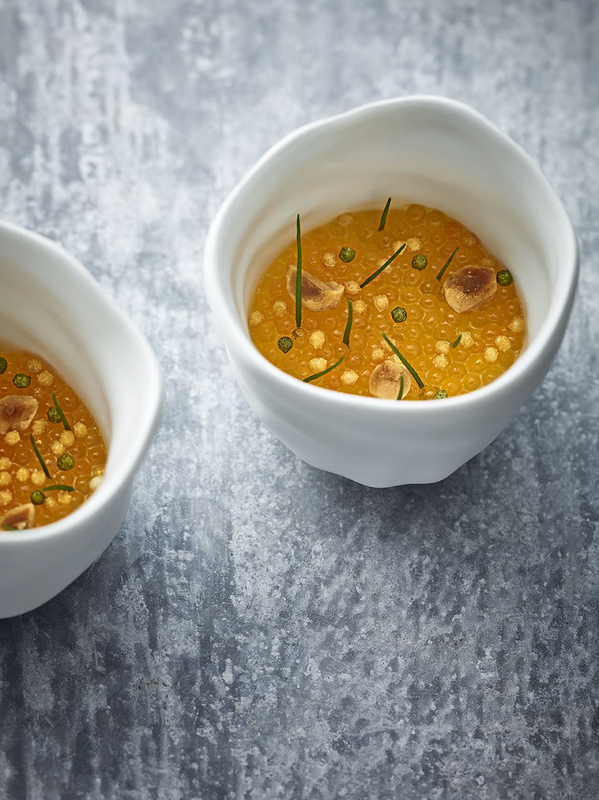 A light and silky chawanmushi (savory egg custard), made with dashi and microcarrots, carrot puree and fried carrot tops, was finished with prawn oil to boost umami and pull the flavors together. Tender lobster was accompanied by the cucumbers — raw, marinated and pickled — that he’d previously gathered from the garden. 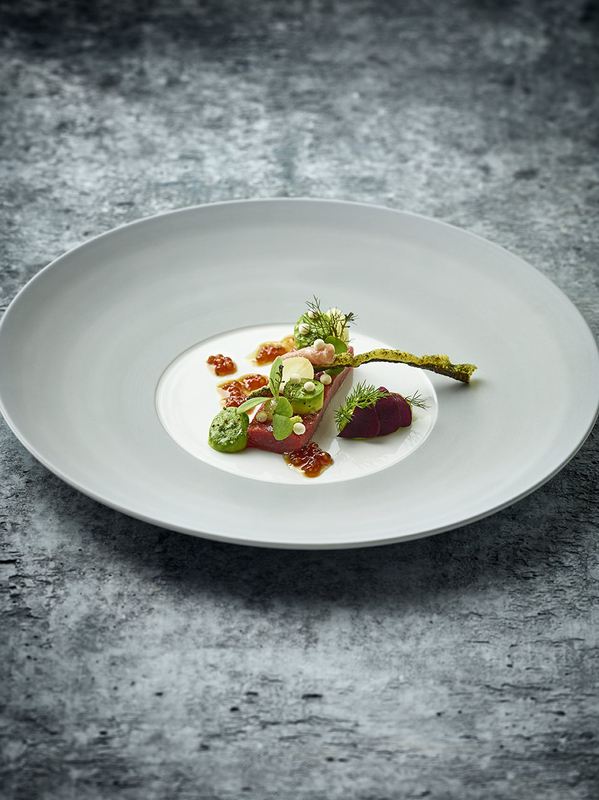 Bavaria’s native huchen (Danube salmon) — a large and rare fish that nearly went extinct until chefs like Nakamura created a market for it — came in a delicate preparation with smoked eel, nasturtium and crispy-tender artichokes with a yuzu-scented sauce. We meet up again at an izakaya tavern in Tokyo, when Nakamura returns for a visit in August. Over fried fish cakes, rice mixed with shirasu (baby sardines) and several glasses of sake, he occasionally slips into Japanese as he reminisces about wearing traditional Bavarian dress at festivals in his student days. During our conversation, I’m reminded of how an Italian friend, who is married to a Japanese woman, once told me that he never uses the word “half” to describe their child: “Biracial kids are not lacking something, as though they’re less than whole. They’re not half; they’re double,” he said. Nakamura is living proof.